Blue Artichoke Interiors: Green Home??? I went to a networking event for the Phoenix Green Chamber of Commerce tonight. I had fun chatting with people and found out that Ed Begley, Jr. is coming to town. He is going to be featured in the "Green" issue for a Phoenix magazine. While talking about Ed's TV show on Planet Green, "Living with Ed", I expressed my concerns with eco-friendly celebrities. I admire that many celebrities are building a more environmentally friendly home. I admire that many celebrities are living off the grid, however whether living off the grid or not, many of these celebrities live in excess. Larry Hagman of "Dallas" and "I Dream of Genie" converted his home to be an off the grid home. The main house of this estate has 18,000 square feet. I'm sorry, but no one needs to live in a home that big, even if it is off the grid. More pictures and information can be found on Ecorazzi. Jackson Browne is well known for his off the grid living. He just bought a fairly modest celebrity home in Los Angeles by LA standards. You can read all about it and see pictures at The Real Estalker blog. I have no problem with the $2.6 million dollar price paid or the size of just over 4,000 square feet. 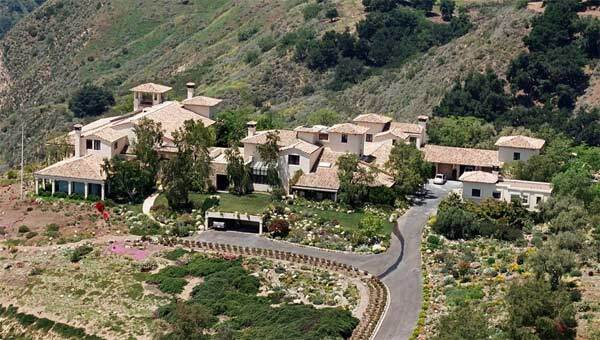 I think that is fairly reasonable for a celebrity home. I'm sure that Mr. Browne will probably go off the grid with this home too or at least make it more eco-friendly. According to the above blog, this seems to be his third California home. Who needs three homes in California? I wonder if any one does. At what point does a home cease to be green? If a home is off the grid, but excessively large, can it be green? When you consider the manpower and materials needed to build a home with a large footprint, I have to say no. It also costs a lot of money to maintain a large property, even if a home owner isn't paying energy costs. Treehugger recently came out with an article worth looking at called "Could Less Become More Again?" I'd love to hear your opinion on excess and how you think it fits in with the "green" home movement. I enjoyed your thoughts on Green Homes. I checked out the link to Treehugger and also enjoyed reading that article...if I think about it, I probably occupy about 800 square feet of our 2900 square-foot home. We do provide storage space for grown kids, that's for sure!